Harley Quinn is by far one of the best female supervillains out there. She's sassy, at times sweet, and just off her rocker enough to be a quintessential bad-gal which is why I knew I had to do a look inspired by her this year. The bold red and black mixed with traditional harlequin details makes for a captivating look that can easily go from full-on-cosplay to last minute DIY costume. And come on, doesn't she just look like the life of the party? Hahaha... Full tutorial after the jump! Here's my completed outfit. This costume is inspired by the animated version of Harley and I used my Stuart Weitzman over-the-knee boots that I bought back during the Nordies Anniversary sale. I actually love that her costume isn't too revealing and this one actually comes with a cape that has 2 jingle balls at the bottom that clink your arrival. 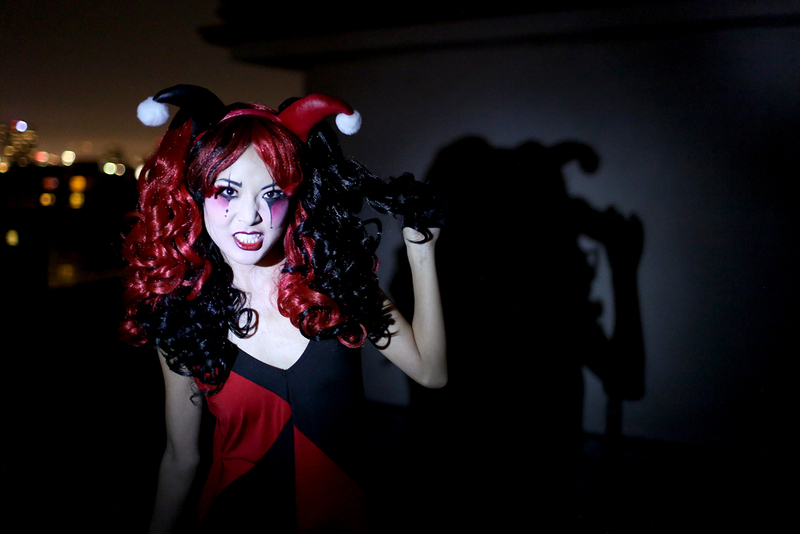 The wig is more like the 2011 relaunched Harley, with half-black/half-red pigtails. The pigtails are actually clip-in pieces so you can adjust them to look perfect once the base wig is on. To me, this look is all about the delicate details. The lines pulling away from the eyes and lips should all be thin and sharp which should contrast with the softly blended cheeks and eyes. And how stinkin' amazing are these lashes from NYX? The red feathers really make the eyes pop! As I mentioned before, you can use this tutorial as a last-minute DIY costume as a basic mine or jester by pairing a white tee with suspenders and black shorts. It's all about the makeup, baby! I hope you guys enjoyed this tutorial! Let me know in the comments what you plan on dressing up as this Halloween or if you have any big plans. wow Jen, this is amazing!!!! Beautiful, Where did u get the handband piece? Is the main base wig long or is it short?